Sunday 22nd February was ‘Founder’s Day’ which celebrates the birth of Lord Robert Baden Powell, the founder of the Scout Movement is a day for celebration and recognition of good works within the scout movement. Roger Beech- Pooley was awarded the Medal of Merit for Good Service to NZ Scouting. 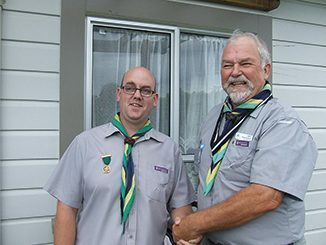 He was involved in the reforming of the Otaki Cub Pack and the Otaki Scout Troop, and has given over 11 years as a warranted leader in Otaki, after completing a Leader’s training course. Two new Warranted Leaders have also been added recently to the Otaki group. Fred Langford is the new assistant leader for Scouts and Michelle Eastwood the new Kea Scout leader. The Kea Scouts, for children from school years 1-3, have not been active for some time, but next term Michelle will have the group up and running. Another leader to help Michelle and Mary Molloy is needed. Brent Bythell 36 4 8949 is the person to contact if you are interested in helping.